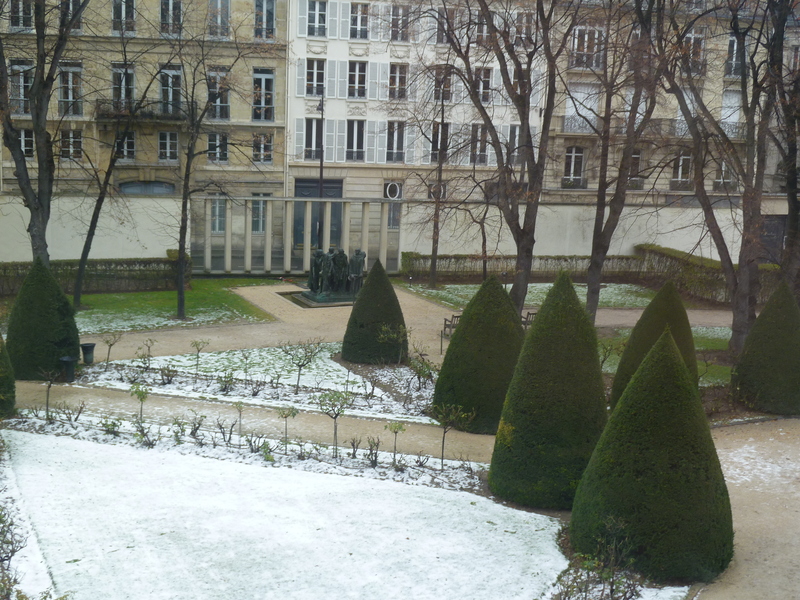 The Rodin Museum is one of the most popular tourist sites in Paris. It encompasses a lovely old house surrounded by a huge garden, with several of Rodin’s bronze sculptures positioned here and there in the grounds. One sculpture in particular is placed so that all passersby can enjoy it, even without entering the museum precincts and paying the admission fee. 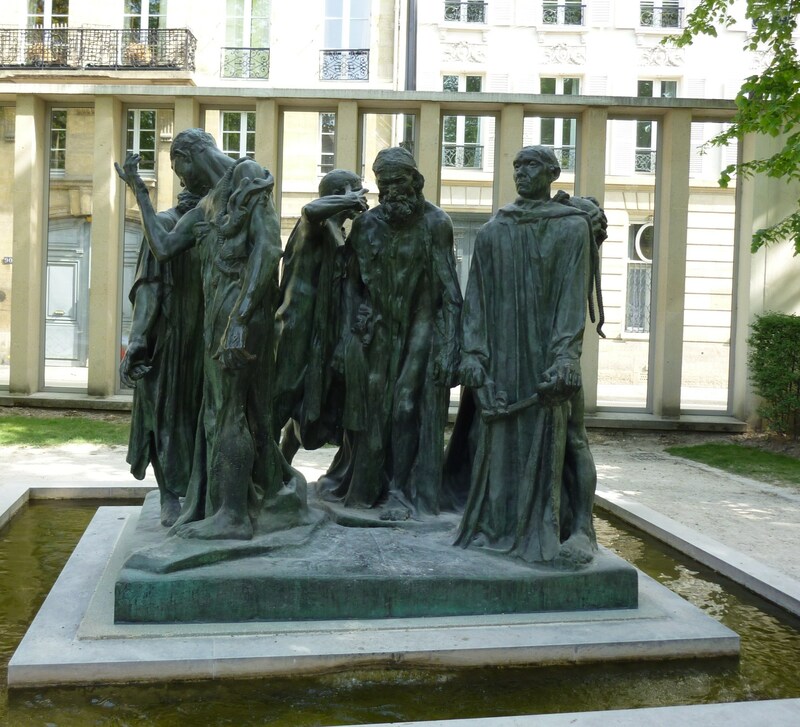 Rodin’s depiction of “The Burghers of Calais” stands near a glass wall, so that anyone walking down the rue de Varenne can see it. Why that piece in particular? I think there is a reason. The queen caused the six citizens to be brought to her apartment, had them clothed in garments suitable to their station, and gave them dinner. Finally she had each of them brought out of the English host under safe guard and set at liberty. Can’t you just see the scene? The six dignified but emaciated men, the stern king, the tender-hearted, pregnant queen, the menacing English soldiers, the exhausted survivors watching anxiously from the walls of Calais… and the chronicler scribbling it all down for posterity, complete with a happy ending for all concerned. Question is: did it really happen like that? Well, yes and no. 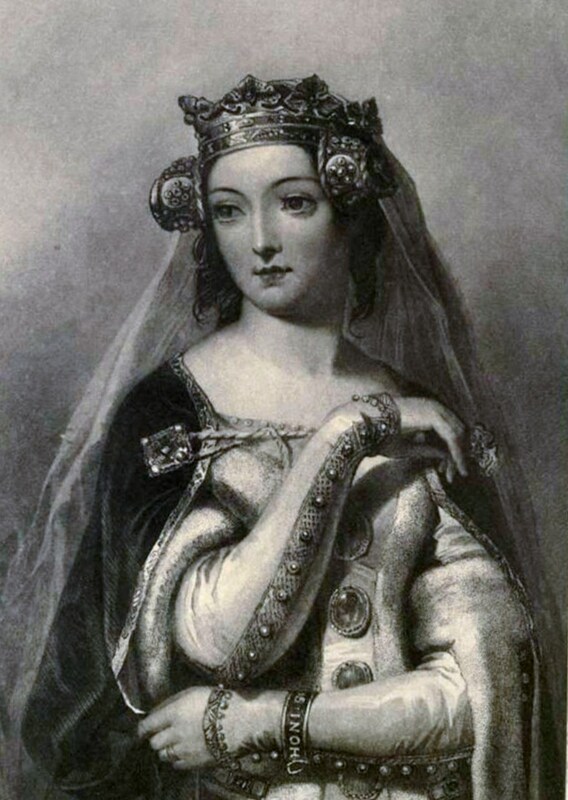 Since I share a first name with one of the protagonists, I thought I would find out a bit more about Queen Philippa and her role at Calais in 1347. Edward III’s queen was known as Philippa of Hainault. She was born in Valenciennes (either in 1311 or in 1314). The town is in the Pas de Calais region, so the burghers were her compatriates. The chronicler Jean Froissart was also born in Valenciennes, in about 1333, and Philippa was his patron. So it is possible that Froissart was inclined to heighten the drama or romance of her life’s events just a bit, for posterity. By 1347 she had given birth to at least 10 children since her marriage to Edward in 1328. Although she went on to have two more children, most historians think it unlikely that she was pregnant when she was in Calais. Some portraits of her, like the one above, make her look doe-eyed and willowy, but her funeral effigy below is probably more accurate. She was rather stout (having twelve children will do that to you), and no great beauty, but a sensible-looking woman who was apparently sufficiently authoritative to act as regent when her husband was away waging war (as he often was). She arrived in Calais fresh from having supervised a victorious battle against the Scots. Froissart says she led the troops herself, but he may be exaggerating. Still, she sounds brisk and competent, and battles didn’t faze her. The siege itself is well documented. Edward needed possession of the town to keep the route from England to France open for English soldiers and military supplies crossing the Channel. Calais was a stoutly built stronghold surrounded by treacherous marshes, and attacking it would have been difficult – or perhaps Edward preferred to leave its fortifications intact. So he chose to starve out the residents. In the early going, hundreds of women and children from the town were sent away by the French commander. The English let them pass without harming them. The ensuing siege lasted eleven months, during which the English set up a small garrison town outside the walls. Edward was hoping that the French king, Philip VI, would come to the rescue of the people of Calais, which would allow for a proper pitched battle against his foe. Thousands of English soldiers were there, ready for a fight. But the French king (who was, by the way, Philippa’s uncle) never appeared. When King Philip failed to appear after all those months, the residents of Calais had to admit defeat. At that point, things get a little murky. Froissart’s detailed account is all very well, but he wasn’t actually there. He got the story from someone else, and English accounts of the siege do not mention the scene with the pregnant queen on her knees. So what actually happened? There seems to be agreement that the six men did emerge to signal the surrender of Calaias. According to one French historian, the business with the barefoot burghers was a typical surrender ceremony, based on medieval penitential rites, and by no means unique to Calais. Apparently, the ritual allowed the conquering sovereign to retain his authority while pardoning those at his mercy. * This theory suggests that executing the six burghers would have represented a shocking breach of protocol. Philippa’s biographer also sheds light on a marriage in which the queen’s role seemed to be that of sorting out her husband’s impulsive gestures, good and bad: “It has been remarked of Edward that he was always more ready to be generous to an enemy that just to a friend; and he gave away posts and honours so lavishly that sometimes he forgot, and granted the same thing twice and three times over to different people, and was then annoyed because they grumbled.”*** Philippa’s job seems to have been keeping everything straight and smoothing ruffled feathers, and one imagines that interceding for six burghers was all in a day’s work for her. But she probably did her persuading quietly behind the scenes, rather than in public. Nevertheless, the story of a pregnant Philippa on her knees became celebrated through Froissart’s chronicles. The story also symbolized French heroism in defeat. Rodin created the sculpture in the 1890s, two decades after a French defeat at the hands of the Germans, giving three-dimensional shape to popular national heroes of the time. Froissart’s story also did wonders for Queen Philippa’s reputation, and may account for the survival of her unusual name. I’m happy to share it with her. Text and original photographs by Philippa Campsie. * Jean-Marie Moeglin, Les bourgeois de Calais: Essai sur un mythe historique. Paris: Albin Michel, 2002. **Ian Mortimer, The Perfect King: The Life of Edward III Father of the English Nation. London: Jonathan Cape, 2006, p. 253. ***B.C. Hardy, Philippa of Hainault and Her Times, London: John Long, 1910, p. 184. ****As for the rest of the inhabitants of Calais, they were expelled, and the city was settled with English merchants and their families. It remained an English stronghold in France until the French reconquered the city in 1558. This entry was posted in Paris art, Paris history, Paris museums and tagged B.C. Hardy, Burghers of Calais, Calais, Edward III, Ian Mortimer, Jean Froissart, Jean-Marie Moeglin, Queen Philippa, Rodin Museum. Bookmark the permalink. It is interesting also to note that the sculpture was at first refused by the population of Calais, because he has not made them “sufficiently heroic” and was only installed after much discussion. 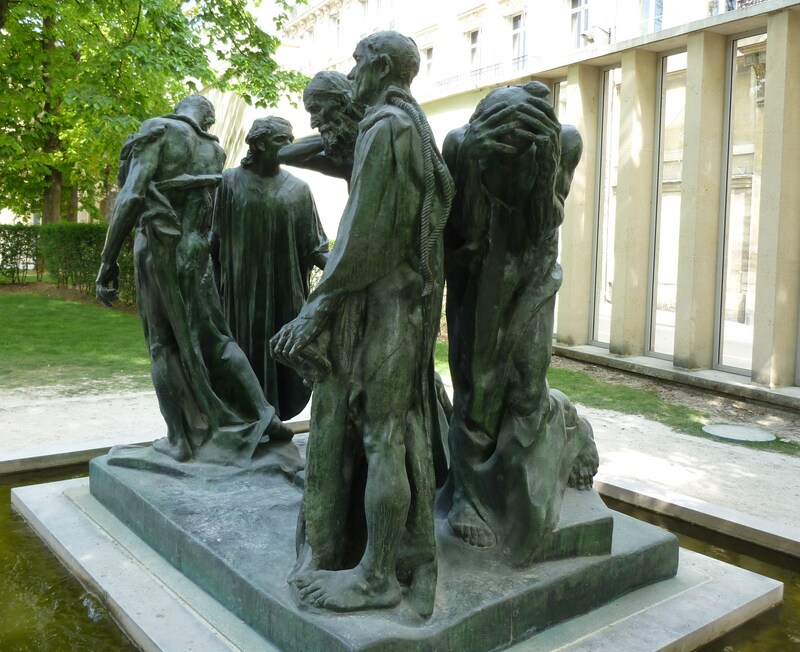 Also Rodin wanted it installed on the soil so that they might seem to be part of the population; at the musée Rodin they are at soil height; but not so in Calais. Forgot another detail; King Philippe had gone to Calais, but when the saw the number of English soldiers , he turned back. Pingback: Theme Rodin – Oh, border!